All Ten Episodes and Gallant New Bonus Features! Beverly Hills, CA – Anchor Bay Entertainment is proud to release the highly anticipated Starz Original series Camelot: The Complete First Season on Blu-ray and DVD September 13th. SRP is $59.99 for the Blu-ray and $49.98 for the DVD. Pre-book is August 17th. The 3-disc set contains all ten episodes of the Arthurian Legend with a kingly lot of bonus features including never-before-seen featurettes, bloopers, behind-the-scenes (including a unique on set visit with actor Paul Mooney), character profiles and easy access episode recaps. When the series premiered on April 1, 2011, it became the highest rated and most-watched debut on Starz. Camelot: The Complete First Season redefines the classic medieval tale of King Arthur with an exciting ensemble cast that includes Joseph Fiennes (Shakespeare in Love, Flash Forward) in the magical role of Merlin, Jamie Campbell Bower (upcoming Twilight Saga: Breaking Dawn, Harry Potter and the Deathly Hollows) as the young and reckless Arthur, and Eva Green (Casino Royale) in her television debut as the darkly powerful Morgan. The character-driven series also features Tamsin Egerton (Guinevere), Claire Forlani (Igraine) and Peter Mooney (Kay). In the wake of King Uther's sudden death, chaos threatens to engulf Britain. When the sorcerer Merlin has visions of a dark future, he installs the young and impetuous Arthur, Uther's unknown son and heir, who has been raised from birth as a commoner. But Arthur's cold and ambitious half-sister Morgan will fight him to the bitter end, summoning unnatural forces to claim the crown in this epic battle for control. These are dark times indeed for the new King, with Guinevere being the only shining light in Arthur's harsh world. Faced with profound moral decisions, and the challenge of uniting a kingdom broken by war and steeped in deception, Arthur will be tested beyond imagination. Forget everything you think you know...this is the story of Camelot that has never been told before. 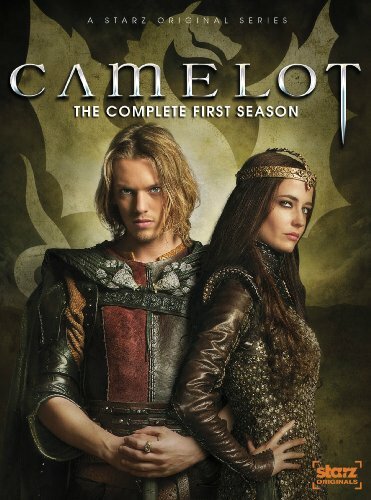 Camelot: The Complete First Season is not your father's King Arthur. It is a distinctly fresh approach to one of the most enduring tales of all time, and brims with love, power and betrayal amidst breathtaking locales. This is truly epic drama at its most grand and iconic.